TREASURED STAR: Garanhão homozigoto e importado. TREASURED: SI 95 Ali Time Leading Money Earning Paint Stallion. All Time Leading money earning 2 year Old. All Time Leading Barrei Horse Sire. All Time Leading Biood Maré Sire. Foi vendido por $85.000. Venceu :Oklahoma Paint Fut, PSBA Fut.,Pot O Gold Paint Fut.THE 18TH RUNNING OF THE APHA NATIONAL CHAMPIONSHIP FUTURITY OKLAHOMA PAINT FUTURITY FINALS, OLDSFIRECRACKER HANDICAP.Produziu: World Champions for Race e Barrel race. INDIAN MUSIC: World Champion Producer. ROM Race Offspring: Easy Jet Too (1981) by Easy Jet; Western Music; Cherokee Indian, Easy Winner by Easy Jet; Easy Rose; Jet Music; Easy Country Music. 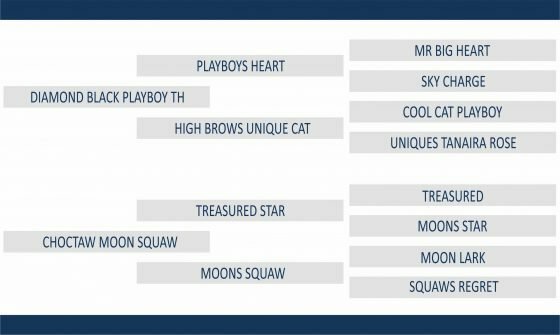 Corrida, inclusive: SPECIAL EFFORT (AAAT-104, Tríplice Coroado-Campeao Mundial, ganhador do All American Futurity e grande reprodutor), NATIVE GAMBLER (AAAT-103,Champion com 12 vits., inclusive o All American Derby), MEDLEY GLASS (AAA-98,12 vits., incl. All American D.), etc. Treasure Glass by Raise Your Glass(TB).